Today biomass, which is essentially biological matter ranging from wood to food wastes, is used for energy all over the world. 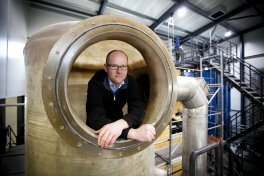 A biomass system created by Danish inventor Jens Dall Bentzen greatly increases the types of biomass fuels that can be used, while further reducing associated emissions and increasing overall energy efficiency. Biomass is often just thought of as refuse. Dead trees, wood chips, sawdust, and agricultural and urban waste are just some of the materials used as this energy source. The energy in biomass can be unleashed through microbiological, chemical or thermal conversion. For a typical biomass combustion plant the biomass materials have to be dried before they can be used as fuel. Bentzen's biomass furnace expands the types of usable fuels, as it can burn both dry biomass as well as materials, which have a moisture content of up to 60%. In addition to greater fuel flexibility, the furnace also offers significantly lower emissions. The furnace's dust level is about 20 mg/Nm3, which is a reduction of about 90-95% compared to standard furnaces. What's more, the total system does not require any filters in order to fulfill the latest emission standards. Also NOx and CO emissions are considerable lower. A further advantage is lower maintenance costs as the furnace doesn't require expensive, high temperature steel-alloy parts in its hotter sections. It can also run at much lower load factors than other biomass furnaces, further adding to its flexibility. Moreover a new gas cooling and energy recovery system has been developed which increases the overall efficiency of the total system by about 20%. The gas cooling system cools the flue gas to below 40°C causing the water vapours in the gas condensate into water. The condensation energy is recovered in an energy recovery system. The greater fuel flexibility, lower maintenance costs, and reduced emissions that the furnace offers, help solve many of the problems limiting wider use of biomass for energy production. After having built and operated a 2 MW pilot plant Dall Energy received its first order for a commercial 8 MW heating plant in 2010. The commercial plant will start operation in March 2011. In October 2010, Dall Energy won the innovation prize at the Spanish bioenergy fair Expobioenergía in the category "Medium to Large Scale Bioenergy Projects".